Ahhh it’s almost the weekend. I look so forward to the weekend so I can sleep in. I get up everyday at 3:30am and work on my blog, then off to my day job I go. It’s funny, as I think about it, I have mentioned my co-workers and work in general, but I don’t know if I have ever told you what I do? It’s actually a top-secret job, no I am just kidding. I am a Senior Executive Assistant for Notified Body. Basically it means our company approves medical devices to be sold in Europe and Canada. Were like a 3rd party to the FDA of Europe. It’s a cool job, but a lot of work. I have been with the company for just over 10 years. The best thing I like about it, it’s like were family. We have fun, we fight and we work well together. So I can’t complain too much! 🙂 Now back to my regular scheduled post. 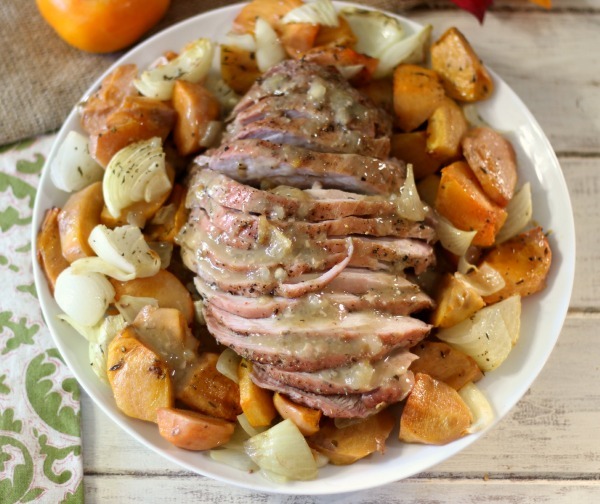 Today we have for you Roasted Pork with Persimmons. I know, I know, another persimmons recipe. I just gave you one on Tuesday. But I told you my boss gave me so many and I swear they are multiplying. I think I have used about 20 persimmons this week and I still have a lot to go. This dish is so delicious and such a breeze to make. The only thing is, it takes about 1 hour 40 minutes to cook, so it’s a nice weekend meal. The pork is tender, juicy and the persimmons are just softened. Roasting persimmons is wonderful because they don’t get mushy. They hold their shape and flavor. Since persimmons is a sweet fruit it compliments the pork nicely. Plus to boot I added a gravy to go over the top. Oh man, so good! I purchased my pork from Costco. It comes in a 4 pack and each roast is about 2lbs. The cost was pretty inexpensive, I think, if memory serves me right it was around $22.00 for the 4 pack. For this meal I cooked my dinner in an oven safe skillet, but you can use a baking dish. I just added my pork, persimmons, onions and some seasoning and olive oil. Super simple, right? Once the pork was done cooking, I placed it on my serving plate and took the juices from the pork and made a gravy. For the gravy I just added 1/2 cup of white wine and a cornstarch and water mixture. Whisk until thick and bubbly and pour over the pork. 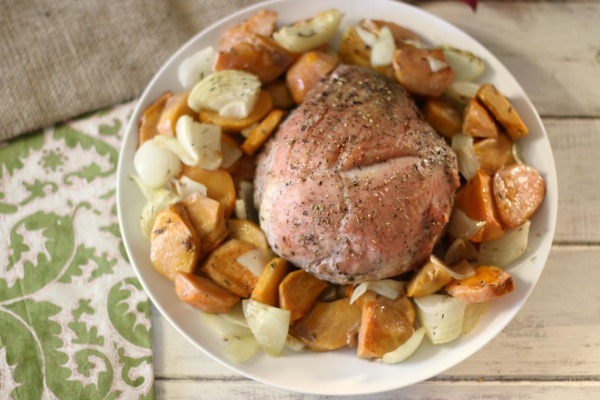 Juicy, slow cooked pork roast served with roasted persimmons, onions and seasonings. In a oven safe baking dish (I used my 12" skillet with high sides) place pork, persimmons and onion into the pan. Drizzle with olive oil and sprinkle with salt, pepper, thyme and sage. Bake in oven for 1 hour 40 minutes or until the temperature in the pork registers 165 degrees. 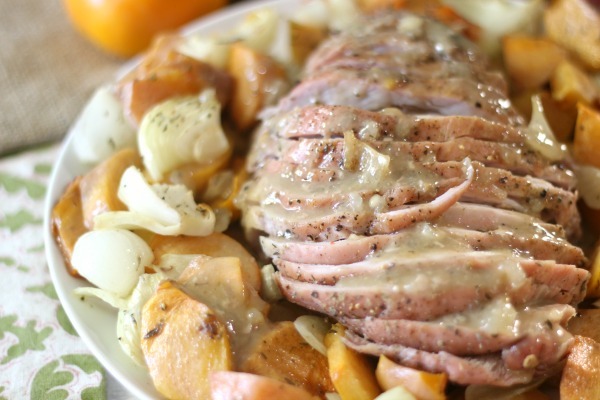 Place the pork onto serving platter with persimmons and onions. Cover with aluminium foil while you make the gravy. In a little bowl, whisk together cornstarch and water. Place the juices from the pork into a skillet, add wine and cornstarch mixture. Over medium heat, whisk until thick and bubbly; about 7 minutes. Pour gravy over pork. Note: You can sub apples for persimmons if desired. You can also sub the wine for chicken broth. Well Guys, that is it for me today! I have been going and going with baking this week and I need some recovery time. Your initial post of persimmon butter inspired me to pick up some persimmons at my local oriental store when I saw them! Never thought to include them in a roast. Such a great idea. Thank you Sandra! How do yo like the persimmons? I’ve never had parsimmins… How do they taste? This roast looks so delicious! Hi Sophia, Persimmons kind of remind me of a toss between an apple and a pear. They are sweet when they are ripe. They are also a little more firm then most fruit and hold up well to roasting and baking. Well that was easy enough and it looks fantastic!! 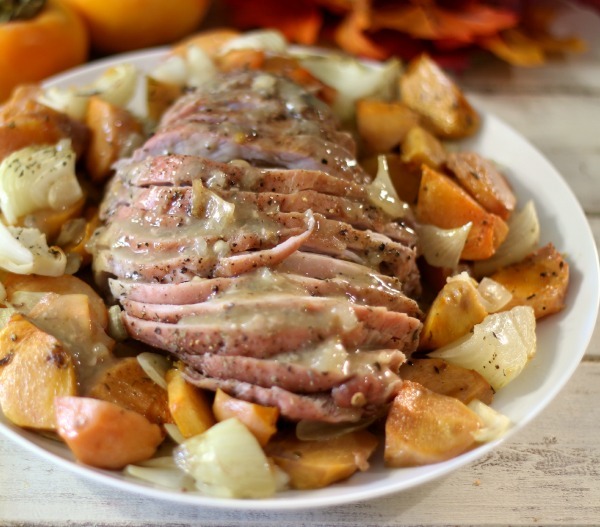 Persimmons sound wonderful with pork! Thanks Chris! The persimmons are a perfect compliment to pork. I seriously do not cook enough pork, you definitely have inspired me to go out and buy some so I can make your roasted pork dish! Thank you Thalia! I know I don’t buy enough pork myself and I don’t get why? It’s so easy to work with and so many things go with it.